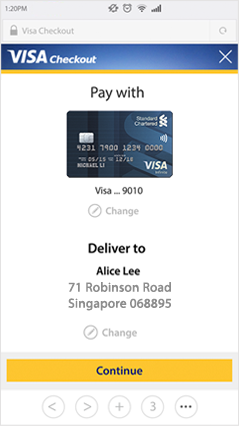 Sign up for Visa Checkout with your Standard Chartered Credit or Debit Card. 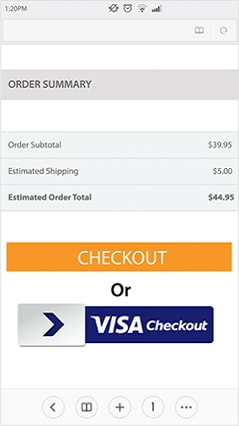 Want to simplify the checkout process when paying online? With Visa Checkout, you don’t need to enter your card number and shipping address every time you make a purchase. Just look for the Visa Checkout button, login with your email and password, and you’re ready to pay! 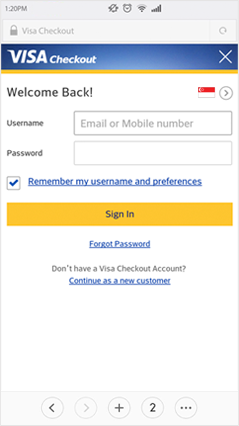 Visa Checkout makes paying online convenient with just one simple login. Pay the way you want, using any Standard Chartered credit or debit card. Spend less time entering your card number and shipping address when you shop online. Shop worry-free! Visa protects your information with multiple layers of security. lane through the online shopping experience. This link brings you to a 3rd Party Website, over which Standard Chartered Bank (Singapore) Limited has no control ("3rd Party Website"). Use of the 3rd Party Website will be entirely at your own risk, and subject to the terms of the 3rd Party Website, including those relating to confidentiality, data privacy and security. By clicking on “Proceed", you will be confirming that you have read and agreed to the terms herein and in the Bank's Important Legal Notices.